See that little brown critter and that little white critter? They're goats stuck on a bridge in western Pennsylvania. The white goat is facing in the wrong direction to walk off the beam, about 100 feet high, and return to solid ground. It’s a longish story (here is the full explanation). In a nutshell, goats are a useful animal in the lower-income countries we cover. They can contribute to the income and the nutrition of a family. We’ve also learned from talking to goat specialists that goats are curious and independent animals — true to the spirit of our blog, if we might humblebrag. And because goats are in our DNA, we figure we have license to cover interesting stories about goats. 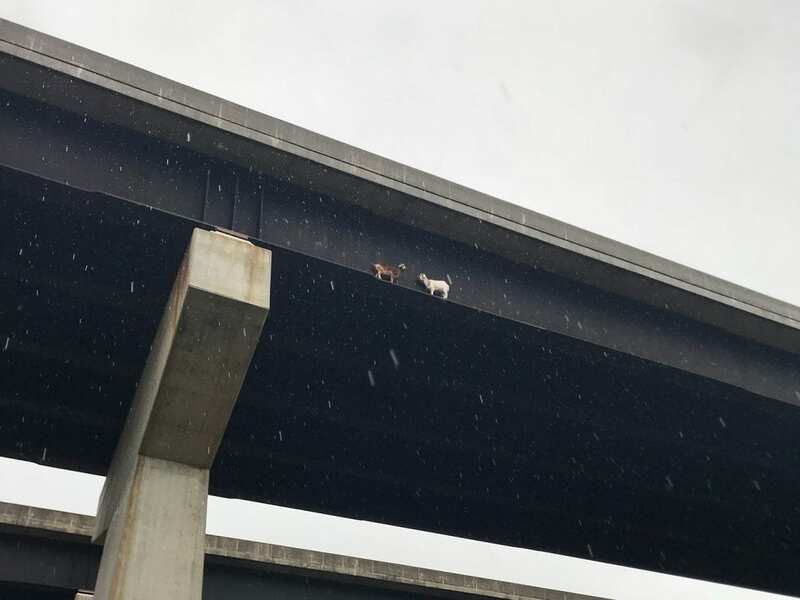 So when NPR listener Jason E. Farabaugh sent us a Facebook posting about two goats stuck on a beam under a Pennsylvania Turnpike bridge in rural western Pennsylvania, we jumped to it. No one knows why the goats climbed up on the pedestal of a Mahoning River bridge and set out along a narrow beam. They’re not talking. But goats do love to climb and explore, notes goat specialist Susan Schoenian of the University of Maryland College of Agriculture and Natural Resources. So these two goats, who are probably pals (because goats are social animals), escaped from the nearby yard where they lived and went on an adventure. They deftly walked along the beam with their very small feet. They proceeded about 200 feet. But it turns out they couldn’t just keep on walking ahead — there was an obstacle that kept them from moving forward. So they had to turn around and head back the way they came. The brown goat managed the trick. “He walked out to a concrete pier and somehow got himself turned around,” says Todd Tilson, operations manager in the maintenance department of the Pennsylvania Turnpike. The white goat did not manage to turn around. That’s why, in the photo, you’ll see the two goats facing each other. Tilson reports that the brown goat “kept hitting the white one with its head” to make it walk backward. “It would take one step, two steps back, then stop,” he says. And really, can you blame it? Would you want to walk backward on a beam that is about 8 inches wide and 100 feet above the ground? The call about the stranded goats came into the Pennsylvania Turnpike at roughly 10 a.m. Tuesday. The son of the owner of the goats said they had been out there 18 hours already. Clearly, a crane was needed. But the turnpike crane was in use, so the Pennsylvania Department of Transportation stepped in. Steve McCarthy, a civil engineer for bridge inspection with the department, was drafted for the rescue effort. “It was my first goat extraction,” he says. He and a colleague got in the bucket at the end of the long arm of the crane. Pennsylvania Turnpike spokeswoman Rosanne Placey called the operation “Goat Watch” and remembers “dozens upon dozens” of status reports from turnpike maintenance folks coming in on her phone. A happy ending wasn’t guaranteed. “If they fall off the beam while we’re trying to rescue them, it would feel like we did harm to them,” Tilson says. “The initial plan was to try and separate the goats so we could could grab the goat facing the wrong way and turn it around,” McCarthy says. But the white goat wasn’t cooperating. “I said, ‘I’m going for it,’ ” he recalls. “I grabbed the goat as tight as I could.” And he lifted it into the bucket. The white goat was deposited on the bridge and handed over to its owner’s son. McCarthy then tapped the beam with a pole to encourage the brown goat to make its way back. His success is a testimony to a value that is sometimes lost in our quick-attention-span age: persistence.